The Beatles have played the soundtrack to my life, as they have to most of the modern world. My first memory of the Beatles was staring at the cover of Sgt Pepper's Lonely Hearts Club Band for ages. Looking at every tiny detail in the rich artwork. My dad had bought it back in the '60s which is strange because he's a jazz man and so not into pop or rock. As I got older I remember my brother playing the album and buying other albums. My cousin, who lived for us for a while, was a big Beatle fan and played Rubber Soul all the time. When I was about 12 or 13, I fell hard for the Beatles. The first ever CD I bought was a Beatles disk (a step up from my first cassette of 1985 Comes Alive). I was obsessed. My good friend and I would read Beatle books, buy CDs, memorabilia, go to Beatle festivals and watch Beatle coverbands and scream. The obsession lasted quite a while. When we were about 20 the pair of us made it to Liverpool and went to the Cavern, Strawberry Field, Penny Lane and all the other Beatle sites. The moment I thought Skip might be a keeper was when he told me one of my favourite Beatle songs reminded him of me (without any prompting). I even walked down the aisle to a Beatle song (In My Life). Since the girls were wee babes I would sing them a Beatle song before they went to sleep. Now most nights they request Lucy in the Sky with Diamonds before they drift off. The past couple of months, I've been putting on a lot of Beatles while they draw or quietly play and I do stuff around the house. 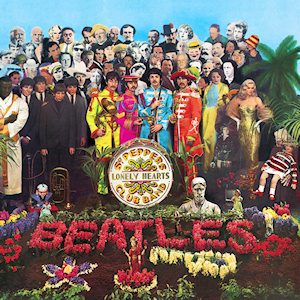 I thought they'd love all the early stuff like Love Me Do and Hard Day's Night, but it seems they prefer Sgt Pepper. I guess there's a lot of child-like rhymes plus some orchestral strings for them to do 'ballet' and twirl to. I wonder if they will have fond memories or if it will just be the old fuddy-duddy music Mum listened to. You walked down the aisle to "In my life"? I love you all the more. This morning I caught Harper, who can't even talk properly, singing her own version of "Here comes the sun". Oh I have no doubt your girls will love The Beatles too, because their Mama loves them! The way I love Meatloaf and Rod Stewart, because my Mama used to play them all the time when I was little... she used to play lots of others too, she was pretty cool in the day, really! But sure, the tunes our parents played are a bit daggy now, but they're also brilliant in their own right. Music like the Beatles transcends generations. It sounds like The Beatles are becoming part of the soundtrack of your daughters' lives - that's so nice! As teenagers, they will roll their eyes to the mention of that band but as they get older it will bring a smile to their face with the lovely memories of their mom. They may even play it on their ipods or whatever it will be in the future. When I moved out of home, Dad and I tousled over which Beatles albums were mine and which were his. My sister just gifted my little Magoo the coolest Beatles t shirt. You are creating beautiful memories with a beautiful soundtrack. All my kids love The Beatles. One my kids used to call Revolution the 'Alright' song. Took a while for me to work out what he was trying to say. Master P likes "Nellow Submarine"! Haven't got him into other Beatles songs yet but it's bound to happen.